This regal French design is the Verona Antique Fireplace. 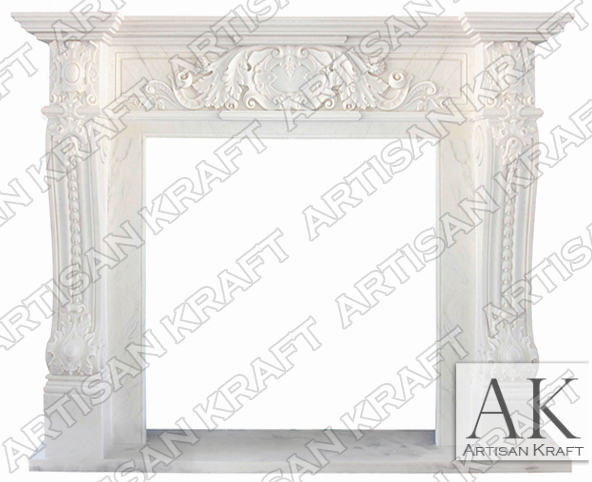 Mantel is pictured in Statuary White Marble with a beautiful hand carved header and corbel legs. Available for delivery in 1-3 weeks. French fireplace with intricate details and carvings. This is a great sale price for this surround that comes with inner slips and hearth. Large decorative piece that makes a statement. For more information on this French Style Mantel follow the link. All dimensions are customizable. Order any fireplace model to your exact specifications. Delivery Charges include curb-side delivery via freight truck. Each block of stone possesses unique natural characteristics making each fireplace mantel unique.